Have you ever used iPads with your students and caught them using a different app than what you asked them to use? Frustrating, right? Wouldn’t it be nice if you could keep them in the app you wanted in the first place? Oh wait, you can! The iPad has all kinds of tricks and hidden gems built in to make life easier for its users. 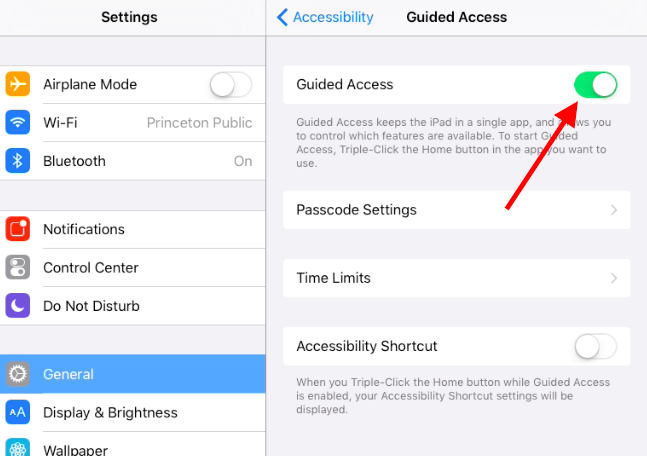 One of them is called Guided Access and what it does, among other things, is lock the iPad into a particular app. It’s not exactly straightforward to find and turn on, but with a little digging, it can make classroom management with many iPads much simpler! Click Accessibility (there are actually several features here you might want to check out, but we’ll move ahead for now). 4. Scroll down to Guided Access (near the bottom). You’re all set! To activate Guided Access, enter the app you’d like students to use and then triple-click the home button. The window will shrink a bit and you will see the Guided Access controls appear on the screen. Click Start at the top right corner and Guided Access will be activated. Now when your students use the iPads and try to back out of an app, it won’t work. They also can’t double-click the home button to scroll between open apps. When you’re done using that app, triple-click the home button to reveal the Guided Access controls again. From there, you can either end or resume Guided Access. You can also use the Guided Access menu to turn off access to particular parts of the screen. This can be helpful if their are buttons you don’t want your students to bump accidentally. Remember, Guided Access has to be turned on each time you enter an app! Next Next post: Happy Birthday, Twitter!